Snack Girl is having her Martha Stewart moment. Yes, I am making shapes for my kid’s lunchboxes. My post about Uncrustables stirred up a lot of controversy and led me to think about making my own. I decided it would be fun to get my hands on a Cut-N-Seal from Pampered Chef (they sent me one for free) and try my hand at making my own frozen PB&J without the crust. Obviously, I am NO Martha Stewart, but my kids really liked these and they don’t know who Martha Stewart is yet - so I am safe. My sandwiches come without the trans fat, high fructose corn syrup, or locust bean gum (whatever that is). I hate to say it, but these were fun to make and I hear that there are plastic sandwich cutters in major supermarkets (so you don’t have to drop $10 at Pampered Chef or be a food blog writer to get your hands on one). I used 100% Whole Wheat bread, all natural peanut butter (no added oil or sugar), and some strawberry jam. Now, Uncrustables are frozen, so I tried to freeze mine in the hopes that they wouldn’t become soggy. The key to this is to wrap them individually in plastic wrap and then put them in a sandwich bag - which I learned from Skinny Mom’s Kitchen. These tasted pretty much the same as the Smucker's version. For those of you who think I am being indulgent by cutting off the crusts of my kids sandwich - every day I receive a lunchbox from school filled with crusts. I know I should try to get them to eat it (oy, the waste! ), but some days it is simpler just to cut them off. I hope they learn to love crusts in the future. For those adults out there who love PB&J, just forget the sandwich maker and make some frozen sandwiches for those days when you are in a rush. It is SO helpful to have a stash of healthy food to keep you from the junk. I have been doing this for a while now. I have the pampered chef cut-n-seal, but have recently bought a square one at my local grocery store, less waste. I make sure I don't go to the crust with the peanut butter so I can throw the crusts in my freezer to make my own bread crumbs with. HA! I indulge me daughter for the very same reason....I was tired of picking the crust out of her lunch box! I'm not sure why she doesn't just throw the crust away! Good idea about reusing the crust MaryJo. I don't have little ones at home any longer but I do have little grandchildren and uncrustables are great. I use the left over crusts for the bird feeder and add a little peanut butter to them. Everyone has a happy winter!! Other than making breadcrumbs, I'm sure you must have some birds in your area who would appreciate the crusts. I've had this tool for years, after reading about it on Chowhound. My daughter loves having circular, crustless PB&Js and I love that I'm in control of the ingredients. Well worth the $, I say! There are also sandwich cutters that will cut your kids' sandwiches into the shape of puzzle pieces (and cut the crusts off). Gives something else for them to look forward to at lunch. I don't have the crust and seal, but I use cookie cutters to remove the crust. A sandwich shaped like a star does wonders for a 4 year old's appetite! Just save all the crusts in your freezer until you have enough to make baked French toast casserole. Then you can send that in their lunch for a yummy breakfast for lunch meal. Dollar Tree has had a few of the bread-shaped cutters in the past, as well, but they don't seal the edges shut. Looks like from the Skinny Mom site, they freeze well even if not sealed shut since the plastic wrap keeps them together. I have the dolphins, trains, dinosaurs, puzzle piece cutters, and a few others. Wal Mart also has them - they're over with the baby stuff, usually hanging on a strip by the baby food and such. I think Munchkin makes them. They're great for tempting my 4-year-old picky eater to eat his lunch. I don't ask "do you want a sandwich?" I ask "hey, what shape do you want me to cut your sandwich in?" and then I get him to come help! Then I ask which part he'll eat first. These are also great if you're making half of a sandwich, which is what he usually eats. Before i make the sandwich I cut 1 slice of bread first then add pb&j. Makes spreading the pb&j on them a bit tricky, since the shapes have weird edges, but it works. The 2 shapes are always identical, except for the train one. One side is an engine and the other a caboose. They're too cute. I checked out the Skinny Mom blog, and one of the comments was, "You can freeze lunch meat and cheese too!!! Do the same thing with your mustard on both sides then dry your lunch meat a bit, add cheese, wrap as you do the PB&J’s. Take care to get as much air out as possible. No veggies or pickles. It works!!" So i may give the ham and cheese a try, as well, and see how we like it. Thanks for the links and info, SG! I put the crusts in the bird feeder and add a little chunky peanut butter and the birds are healthy and happy all winter long. Too funny, at 12 months my daughter was eating the whole PB&J sandwich and now at 18 months she has been watching her older sisters leave the crust on their plate and she has started doing the same thing. Rrrghh! So I do have a cute little butterfly sandwich cutter from the Target $1 bin. But I hate using it because of all of the wasted bread! I love the idea of saving the crust in your freezer for later use. I should keep an eye out for the type that seals the sandwich. 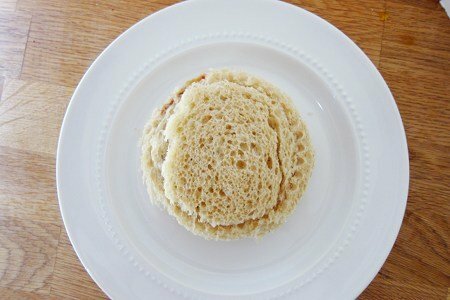 Are there any other types of sandwiches beside pb&j that you can make with that? We save the crusts and endpieces (which nobody will eat) in the freezer for when we go to the duck pond to feed the ducks! Save the breadcrusts and make bread pudding. Milk, eggs, bread, apples, raisins, cinnamon, etc. How about a low sugar healthy recipe? I had one of those pampered chef tools and I could never ever get it to work right, always ended up messing up the bread so I threw the tool away. Don't know what I was doing wrong. Ugh. I have one of these and rarely use it anymore, but when I did I learned I got much better results when I flattened the bread out first. 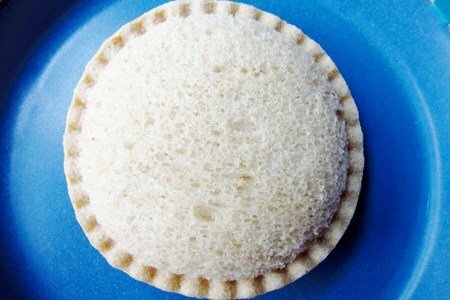 It cuts and seals much better and comes out very similar to the uncrustables then. I use a rolling pin to flatten out a piece of healthy whole grani bread (crusts removed) Spread out your peanut butter and jelly and roll up like sushi. I then cut it up like sushi and put in a plastic container to send to school. Kids love it. It is easy to eat and looks like sushi. You are not crazy for cutting the crust for your baby.. we are moms! That's just what we do! Our kids will be thankful they had moms who took the time to do little things like that for them one day! Cute idea! The crusts make an awesome French Toast Breakfast!! !